The Dry Mills State Fish Hatchery was established in 1933. The facility was originally constructed by the Federal Works Project Administration (WPA) in conjunction with the New Gloucester State Fish Hatchery that is located 1.5 miles away, with the intent to create the largest hatchery in the world. This plan was abandoned when it was discovered that it would be impossible to maintain adequate water quality for the many raceways being constructed. In 1960, the original rearing pools were renovated into concrete raceways, with further development in the mid-1980's. In 2004, a facility bulk oxygenation system was added and the "hatch house" buildings were fully modernized by 2009. The iconic round pond was completely renovated in 2013, including a new informational building with fish viewing tanks. Water for the facility is supplied by a series of natural groundwater springs from three primary catch basins that are capable of providing a flow of 1,200 gallons per minute at fairly constant temperatures. Species reared at the Dry Mills facility include brook trout. 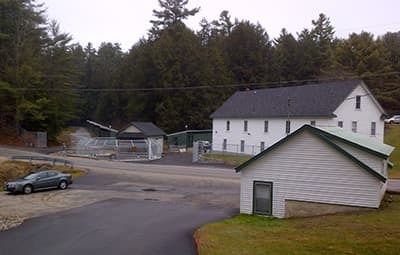 The Dry Mills Hatchery serves as one of the primary suppliers of brook trout eggs from Kennebago broodstock, and the primary egg incubation facility producing advanced brook trout fry transferred to other rearing stations operated by the Department.